Item Information. Local Pick Up is available. Any warranties are through Manufacture, if Applicable. Free Pick up if you are in the Philadelphia area. your zip code and I'll check. 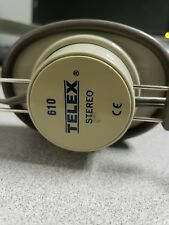 Telex 610 Headphones Vintage. Condition is Used. Shipped with USPS First Class Package. 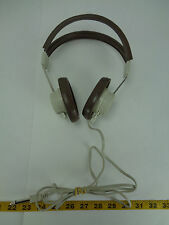 vintage headphones with Mic, TELEX 2400 PILOT HEADSET. Condition is Used. Shipped with USPS Priority Mail Medium Flat Rate Box. 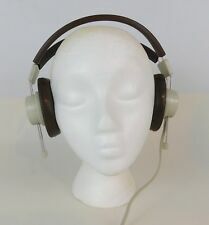 Vintage Headphones Telex 610-1 6000. Condition is Used. Shipped with USPS Priority Mail. Type Binaural. The Explorer raises the bar for headphones with dependability, quality construction and value. All five Explorer headphones use its 7' replaceable cord with model choices of. It is trusted and widely used in typical mono functions (ELL / ELD, language labs, speech pathology) and stereo modes with computers, gaming and for music appreciation classes. All are in perfect condition in the original plastic bag. Great quality! 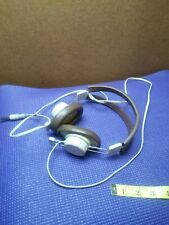 Vintage Blue Telex Corded Headphones Tested Working. Condition is Used. Shipped with USPS Priority Mail. 6.3mm (1/4") connector. From Local Middle School. Local Pickup Available. Excellent New Condition. 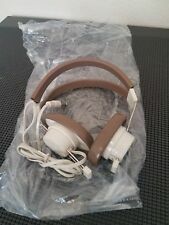 Education school headset. This headset has been tested and they sound great. 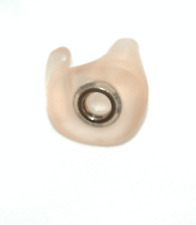 Is VERY comfortable to wear and provides top quality noise reduction. - is in "like new" condition and free of any noticeable wear and tear. - has always been nicely cared for and was never exposed to smoking. Condition Note: Item appears new and never unused. Only what is included in pictures is included in sale. We are not experts in any given field. We want you to be confident when purchasing. Condition: New, Open Box. IF A P.O. BOX IS YOUR ONLY OPTION. Adjust headphones on the side. Good condition. See photos. BOX OF IFB's and more. Conditions are Used. There are 7 ear pieces that are in almost new condition. Low cost, lightweight comfort, a two-year warranty and exceptionally rugged construction have made the 610 series the best headphone value in the educational/training field. The spring steel headbands are padded and nearly impossible to bend out of shape. Lot of 8 TELEX 610-1 600-Ohm & Califone 2924AV Headphones Distribution Box/Case. Condition is Used. All tested and working. 4 Telex and 4 Califone. All have 1/4 inch jacks. Came from local school. Comes with everything pictured. We do our best to test and describe every item honestly. It is normal for a used item to have normal signs of wear/tear. 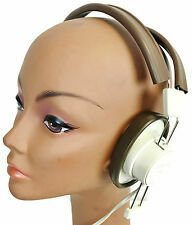 These headphones have not been tested. There is typical wear and tear apparent on this item. Scuffing and scratches are generally present throughout. Will not affect functionality of unit. Includes 7 blue and one brown. Multiple headphones available. Buy in bulk and save. Adjustable headband. 6.3mm (1/4") connector. Color: Brown. Item details: What you see, is what you get. We may have it in inventory that hasn’t been added yet. No signs of use on this headset. I did test it, both the headset and the microphone are working fine. Original box in great shape as well. I'm guessing this is roughly 50 years old, plus or minus a decade. THIS MODEL IS. MODEL NUMBER MARKED ON THIS ITEM IS: 610. machine room operator. WITH 1/4"(STANDARD BIG PLUG) CONNECTOR. LOCAL PICKUP PO#S, ATTN, ETC other uses include.